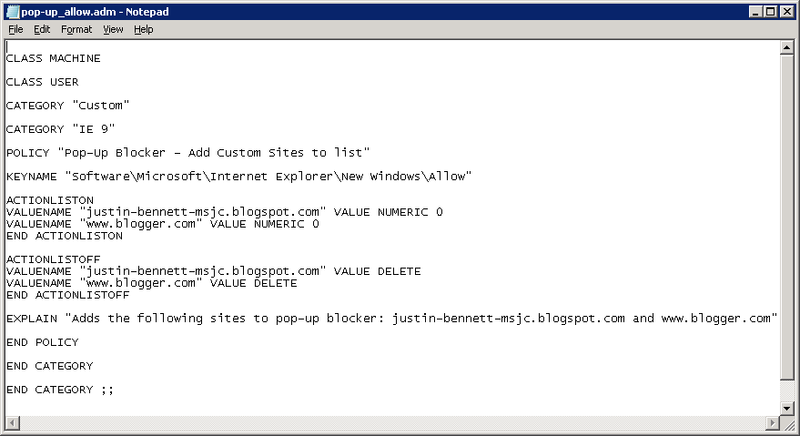 I've been reading around TechNet forums about an issue with IE9 not allowing administrators to set a policy for the Pop-Up Blocker's Allow List within a group policy. I stumbled apon this as we're expierencing the same pains of this issue. "What to do?" you might ask. 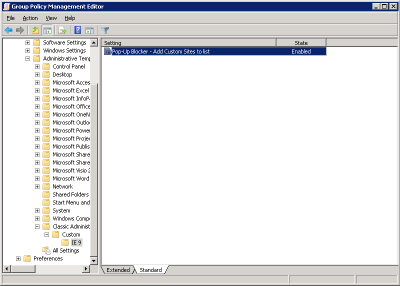 Create an old-school .ADM template in notepad, like we've done. NOTICE: Proceed with caution. 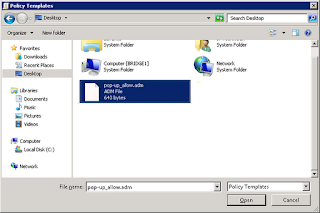 The assumption is that you know how to work with Group Policies and Active Directory before proceeding. There is no warranty implied. 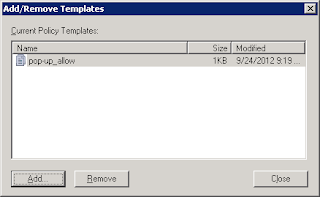 Select the text below and copy it into notepad. 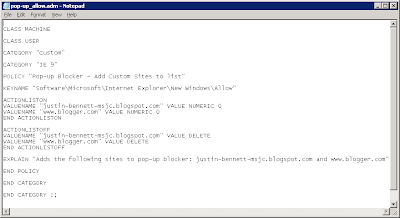 Add / Delete / Modify the websites as needed. 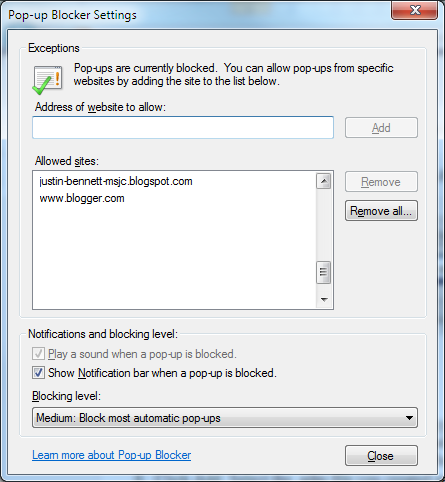 POLICY "Pop-Up Blocker - Add Custom Sites to list"
EXPLAIN "Adds the following sites to pop-up blocker: justin-bennett-msjc.blogspot.com and www.blogger.com"
Type in a GPO name of your choosing and click Ok.
Click Add. 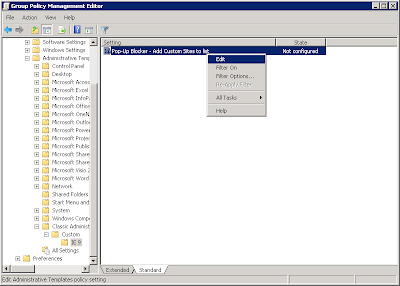 Select the .adm file you created earlier and click Open. Then click Close. 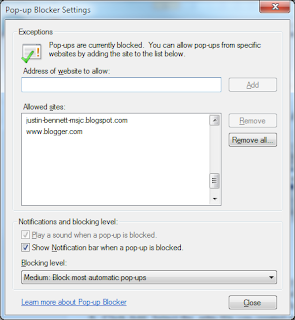 Reboot a user's computer and check to see if your custom sites have been added to the pop-up blocker allow list. 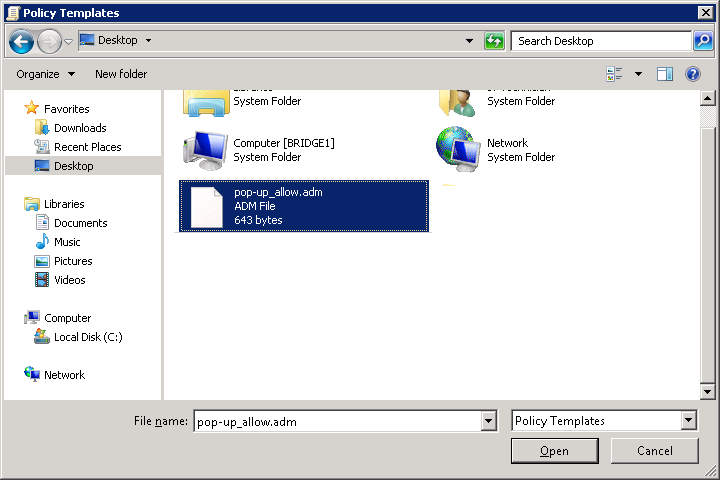 Disable the custom group policy setting. 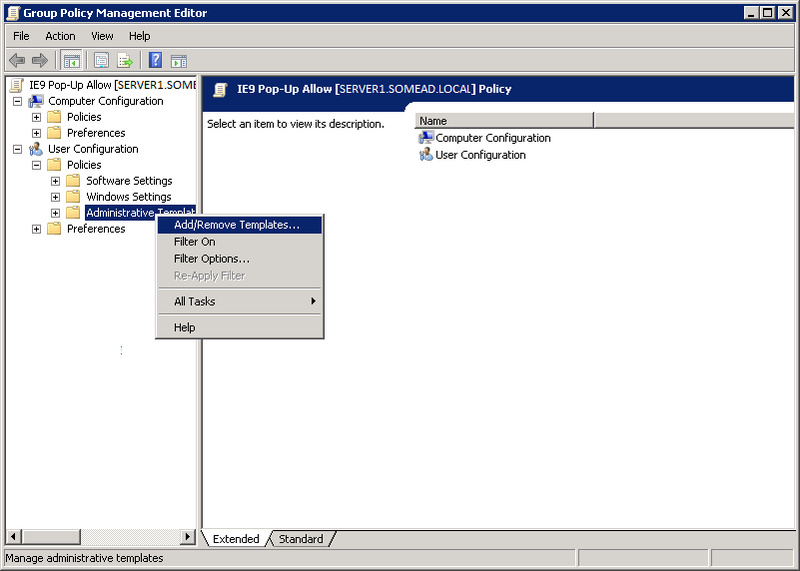 Remove the .adm file from the Add/Remove template. Add the new .adm file to the Add/Remove template. Enable the custom group policy setting. Just wanted to say thank you. This worked for me. 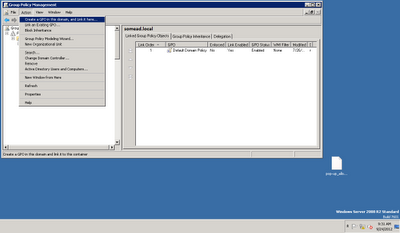 Dont forget to enable loopback as well. 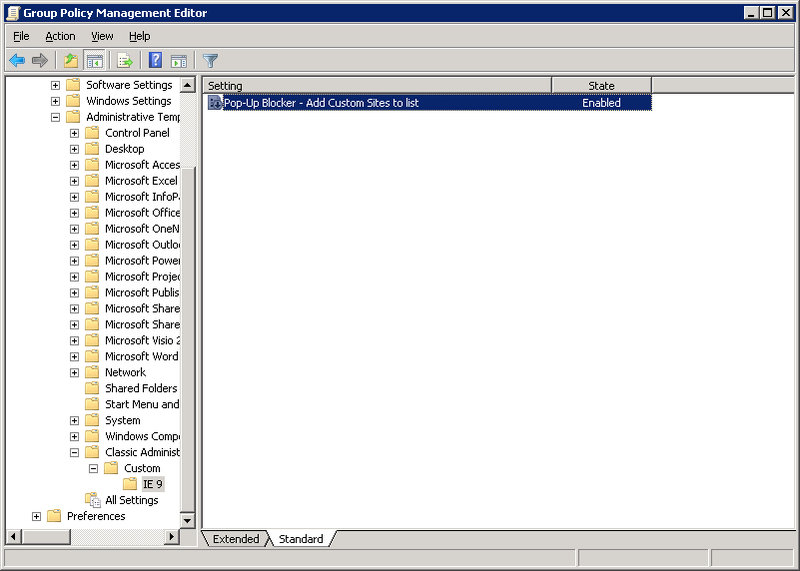 I had exactly the same experience, i tried to configure exceptions to IE's popup-blocker, both as a computer and as a user policy, with no success. 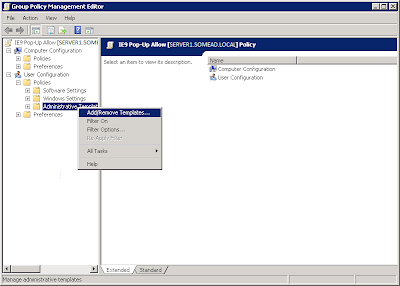 The setting is there in the registry, under the policy-tree, but it's not "read" by IE9. 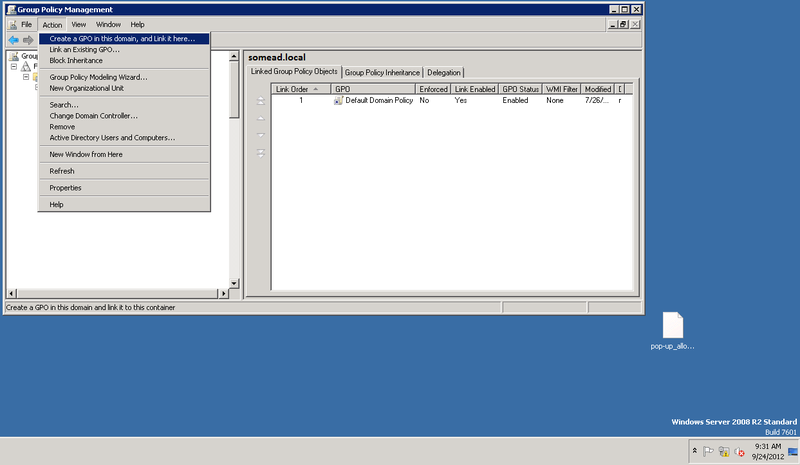 I ended up with using a Group Policy registry Prefence, which works, but it's not as good as a ordinary Group Policy.